With an experience of over 22 years in the Outsourcing and In house business, our community highly recommends Anca as a true Outsourcing professional! 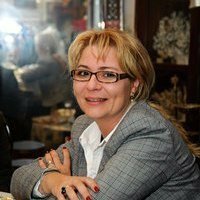 A Finance and Insurance graduate from the University of Bucharest and with an Executive MBA granted by the City College University of Sheffield United Kingdom, Anca has started her career working for companies in various and interesting domains. She is an experienced Quality Controler , and had her first management experience in an international company, VOSKOV MOULINEX, on a position of Executive Manager, monitoring the activity of over 50 employees and managing the company’s finance department. Her professional experience at Genpact Corporation begun in 2006, where she held a management position, Team Leader, for a team that handled a portfolio of customers also based in Germany. Her responsibilities included leading the Accounts Receivable Operations for the German clients, team performance supervision – coach and support, monitoring key performance indicators & targets of the team and last but not least, coordinating and supervising follow-up process and ensuring accurate and timely resolution of agreed actions. In 2007, Anca was promoted, inside the same enterprise, Genpact Corporation, to a position of Operations Manager. In this position she managed the F&A Operations for a global company ( AP, OTC, GL & Procurement Processes) –Pharma industry. She is a strong communicator, experienced relationship builder and always works in a proactive manner. Interested on improving the team’s capabilities, she handled all performance evaluations and identified the training and coaching opportunities for team members/ team leaders. Since 2011, she occupies a position of Service Delivery Leader inside Genpact Corporation, Leading the F&A Operations for different accounts within the CPG/Retail business ( AP, OTC, GL &Procurement Processes / + 100 Headcount). She is responsible for meeting the financial target and execution of operating plan and also account planning and delivery support strategy. Fluent in German and English, with a Green Belt certification – Lean – Six sigma and also with a vast experience in team management, Outsourcing Advisors highly recommends Anca as a true Romanian Outsourcing Professional!